I had a difficult time my first year of marriage. At only 20, I had married my high school sweetheart and was swiftly moved away from my family home in Michigan, not knowing I would never again be closer than a long trip home. I didn’t know the years I would miss, the family gatherings that would be lost. I didn’t know I wouldn’t be a vital part of the growing up of my younger siblings, would never participate in the lives of my nieces and nephews, and that the golden, but aging years of my parents would always have to be ‘a phone call’ away. I didn’t have that foresight then. I was young and romantic; devoted. I had lofty dreams of life in the Rocky Mountains, a white picket-fenced cottage with roses around my door, and promises of children of my own with a boy I only thought I knew. It was a lonely year, the first of many. 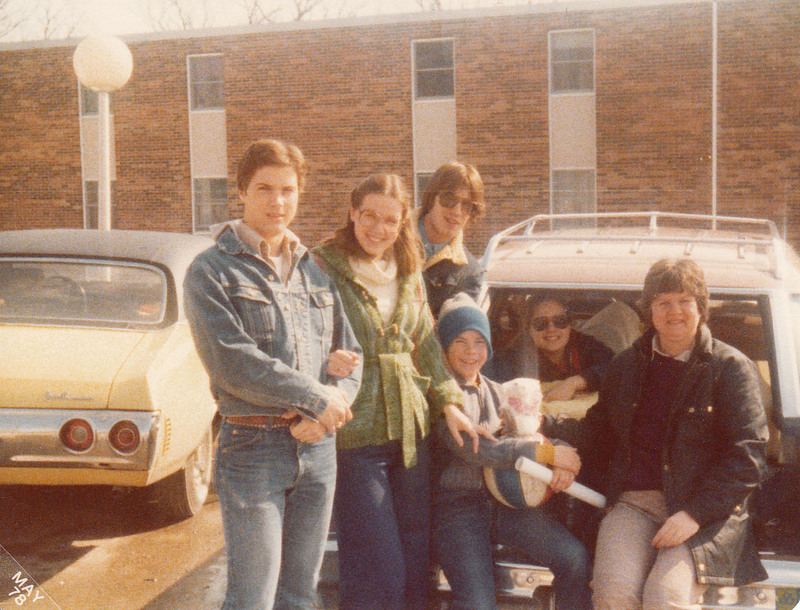 On that first Easter following my marriage of 1977, my parents and younger siblings came to visit me and my new husband at Western Illinois University where he was doing his graduate work and I, well, was busy being a supportive wife. I will never forget the excitement I felt at their arrival. Every little detail in place, my new china and silverware was stacked and ready with cloth napkins in blue calico fabric that I had sewn myself. I had made my mom’s potato salad for the first time, and everything was airy and clean to make that good “welcome to my home” first impression. My heart was bursting with joy and anticipation! To be physically embraced by my father and mother again, to giggle and share my pretty ‘grown-up’ things with my siblings, to show off my ‘first’ little apartment and make dinner for all of them, was the height of my new married life. My mother brought me an Easter plant, a single purple hyacinth. I was so charmed. An unexpected gift, beautiful in its simplicity and so like my mother; I just loved it. I can still see that moment of them walking up the stairs of married-student housing where I lived a rather solitary life of ‘wifedom,’ my husband often gone at classes or studying late into the night with ‘friends.’ I spent most of my home hours alone. So, I became very self-sufficient. I worked in town at a local dress store, had a favorite spot at the drugstore lunch counter, a fragrant hippie shop and organic food co-op that I frequented, but I really didn’t have any friends. After living a life of constant company in a big family where ‘togetherness’ was the norm, it was both a great learning experience and a sad existence for a young bride. I took from it what I could. But to have my family there after that long cold winter, the earth rich with the fragrance of awakening, the remnants of old snow still lacing the edges of the roads, and the voices and faces that mirrored mine; I was in a sort of surreal bliss. We drove around the community and shopped in the quaint town square with the old stately courthouse at its center. 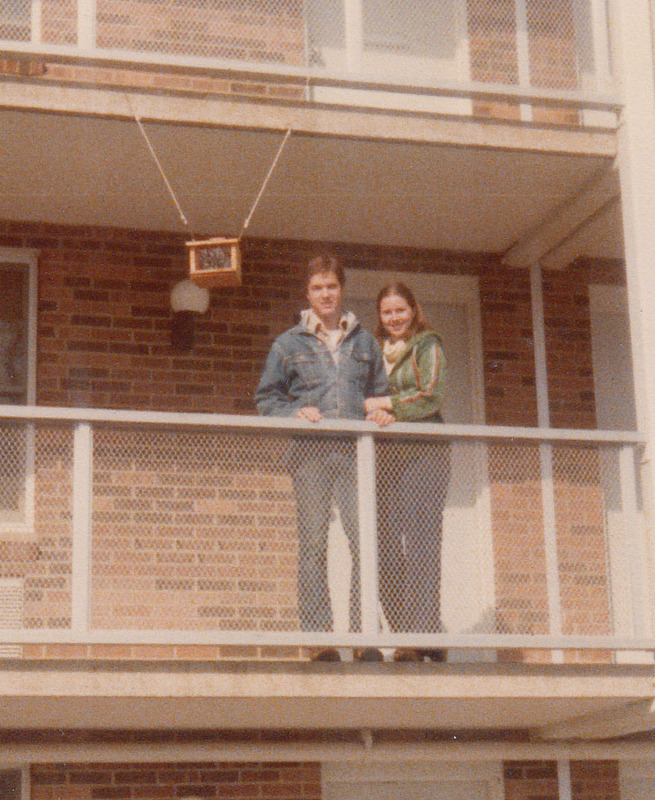 My parents reminiscing about the Midwestern farming towns they had lived in gave a sense of continuity to my daily life. We strolled through some of my favorite shops where my mom bought some stained glass sun catchers to put in her kitchen window. She had them for years, saying that whenever she saw the light coming through the cherry red glass, she thought of me. I found them last October in the boxes of ‘junk’ that were to be given away after my mother’s death, and brought them home to continue to catch the light of our love. We went to Mass, and together with the family talk and shared stories the meal was made perfect even in the cramped space of our small apartment. The weekend was too brief. Life would be too brief. 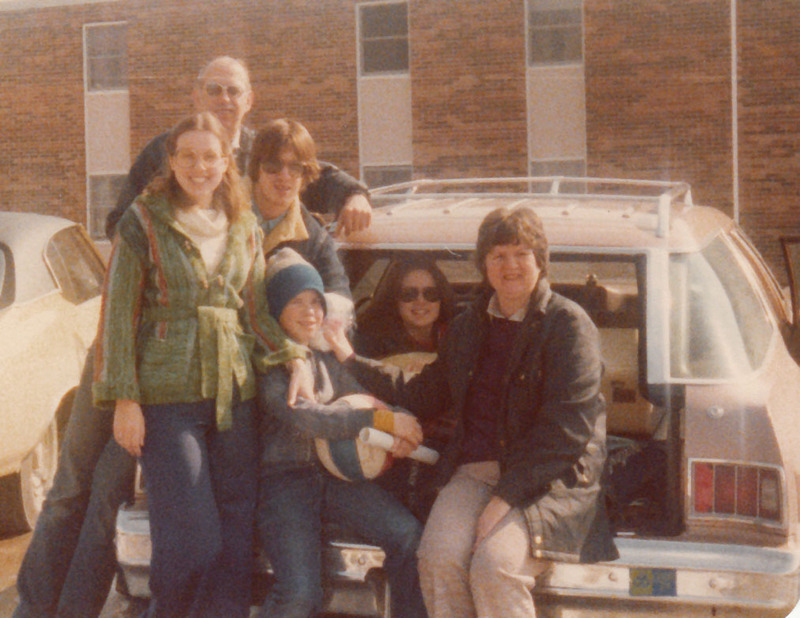 It would take years and years of driving home through miles of cornfields, across wide prairies, through northern forests and hours of shorelines, through the cycles of many seasons, for me to learn, really learn what my parents meant to me. I have nothing but a heart full of gratefulness for what my parents were able to give us in those post-WWII years of large families and stay-at-home moms in which I was raised. We were, by today’s standards, the middle-class poor. We had our share of charity boxes of clothes brought to our house, hand-me-down toys, and meals of mostly mashed potatoes and gravy. But for everything they could not afford to give us, and for all the innocent mistakes that young parents stumble through rather hit-or-miss, I was saturated in love in their house. We were never in ‘want’ or deprived of education and opportunities to develop our imaginations, and music was threaded and laced through every step of our lives like the laces on our shoes. Through their love and high value of education and music, I developed an appreciation and understanding of the human experience. Both have been my refuge and stronghold through all kinds of challenging situations. But, above all, the unconditional love of my parents, has kept me alive in times of despair, motivated me to continue to reach for my dreams, and given me the ability to fully love others. They exhibited what I have learned to be a true love… attentive, unwavering, and never ending. The beauty of these immeasurable gifts is that long after I left home, married and married again, went through college, bought and sold homes, earned a living, raised children, and watched those two beloved people lowered into the cold ground, their gifts have been alive and fruitful in my life. At Easter, Christians humbly observe the sacrifice of Jesus Christ, and celebrate His return to walk with us throughout our lives, loving us, forgiving us, and embracing us with unconditional love. His love seems to reflect, in my eyes, the intentions of my earthly parents, their sacrifices and continual love. Especially at Easter, with the green glow of budding trees creating a fresh lense on old hopes and dreams, I feel their reassuring embrace. I may be little goofy singing ‘Easter bonnet songs’ and over-stuffing woven baskets with familiar treats, but these are only extension of the rich life that I have led, due for the most part to my parents walking up the paths of my life with their gifts. 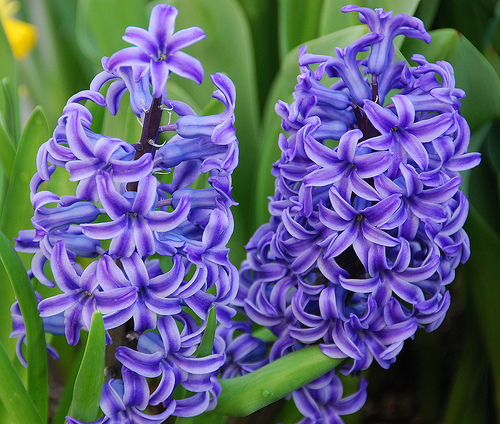 My little purple hyacinth eventually died despite my care, as did my marriage, and, in time, my parents. But, to this day I cannot look upon a hyacinth without seeing my mother’s soft round face, laughing and eager to see mine, coming up the walkway with that flower in her hands, with my dad’s big grin above her shoulders close behind. The safety of their love was so strong and deeply rooted, that nothing could destroy it….not distance, not husbands, not mistakes, not the act of walking a down a broken road, not failure or any choice that I made. It was there. They were there. Even on this Easter weekend of baskets full of colorful foiled candy for my children and grandchildren and the aroma of those favorite family foods once again in the air…they are here in my heart as is my heavenly Father whose invisible hand is always holding mine, reminding me that I am never completely alone. I never did make it to Colorado and have yet to get my cottage with a picket fence and flower garden around my door, but I will. I am still the romantic, but with a long journey of lessons on my side. And, there will be a special place for hyacinth bulbs to bloom, glass sun-catchers in the window, a song to float easily from my lips, and a calm knowing that I am and always have been loved.